Happy Friday, everyone. Sean sent me the video above, and I had to share. What you see is the making of a John Neeman axe. As others have pointed out, the sale of handmade products — especially bespoke products — put food on the table of artisans. So we love to see the process, and we also like the idea of spreading the word about their products. The forge has always struck us as pretty primal, and watching someone use one to make one of the oldest (and most useful) tools around seems like a great way to end the week. Enjoy, and we’ll see you next week. UPDATE: Apparently the original video owner decided to make the video private on Vimeo. Thanks, Aleksejs, for pointing out an alternate YouTube link in comments. I swapped it out above. I really love the reverse axe he uses to split kindling at the start. Heh, that’s called a hardy or hot chisel, fits in a square hole in the anvil. You also use it to cut or slot iron in the same manner. This is what built this country, hard work to build a quality, useful, and beautiful product. It’s great to see the younger generation keeping this spirit and artistry alive. Couldn’t agree more Gary but these guys aren’t here. They are in Latvia. Yep, should have done a bit more research. Still though it is a younger generation making these great tools and carrying on a great tradition. For sure. I was wondering what someone would have to sell one of those axes for to do it here in the US. I’d guess the cost would about double for that level of finish, though guys like Tim Lively were doing it (sans electricity) and still selling knives in the same price ranges. Sadly, I get a notice “Private Video” when I try to play this. Thanks! I updated the post to reflect the new YouTube link. Hey there. 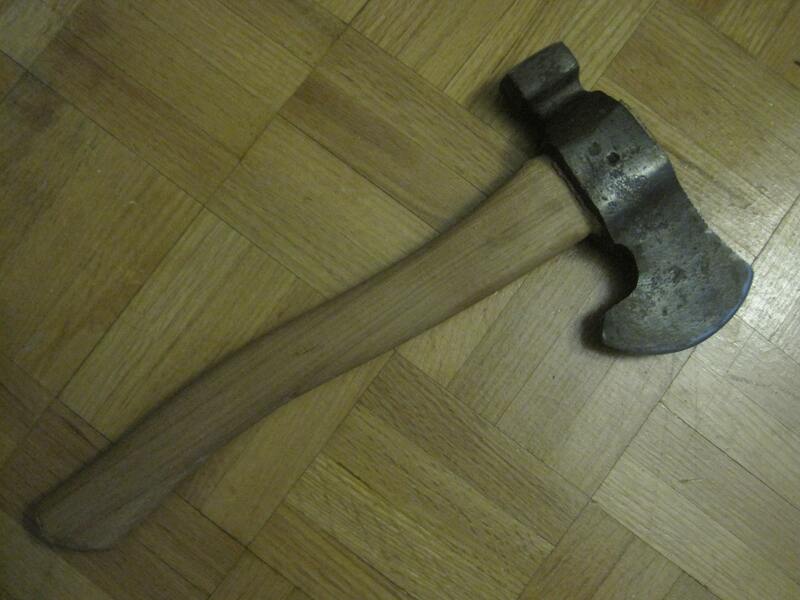 I’ve been blacksmithing for a few years, and I’ve never tried an axe. I gave this method a shot, and it turned out pretty well. I didn’t use a piece of tool steel welded in place for the blade, but instead made the whole thing out of 4140 (I wanted a hard hammer face on the back), but apart from that, and giving the blade a beard, the process was pretty much the same. Thanks for posting!